As you can probably already tell from a lot of my posts, Fall is my absolute favorite season. I just love everything about it. I have been working on a few fall crafts and thought of the coffee filter wreath that I had seen on Pinterest. I figured I would give it a try. Here is what you need if you are interested in making one. First you need to place all of your coffee filters in a sink and run just enough water to cover them. Then put a few drops of food coloring of your choice in water. Let soak for a few hours or until you get the desired color shade you want. Then wring the water out of the filters and let completely dry before attempting anything else. I made the mistake of bundling too many coffee filters at one time together. That's why the bottom of the wreath looks so bunched up. So use less filters when forming triangles. My friend Kelli also made one that I find easier to make. She didn't use food coloring. She hot glued the filters just the color they were and then spray painted the wreath her desired color. It cuts down on a lot of time. I really enjoyed making this wreath, It's different from all of the mesh wreaths that you see. What I liked most about it was that it was very inexpensive to make. I will definitely be making more of these! Hope you enjoyed the tutorial! What fall crafts are you making? 1) Raylan turned 7 months old! How can this be happening? Didn't I just have him last week? 2) We celebrated our nephew Jeremy's 18th Birthday...He shouldn't be this old either. He was 8 years old when Justin and I got together...Shew I'm getting old!!! 3) We were finally able to make it back to church. I have missed it so bad. We wasn't able to go for a while were Raylan and I both were sick. It was good to be back in the house of the Lord. We had a wonderful service with a great guest preacher. 4) I finally started my Christmas shopping. I went and put somethings in layaway that I had been putting off for far too long! I'm so excited for all of Raylan's 1st Holidays! 5) We celebrated my brothers's 22nd Birthday. He shouldn't be this old either. The only thing he asked for was to be taken to Gatti's so that's where we went. Isn't he a handsome young man?..BTW he is awesome at the game Deal or No Deal...He racked up some serious tickets at Gatti's! As a mom, do you ever have those days that just don't start out right? Well today was certainly one of those days. Raylan hasn't been feeling good lately (Teething is the devil) so you can tell where this may be going. Anyway, today we had planned on taking my brother to Gatti's for his birthday. So this morning as I was trying to get ready, Raylan decided to throw a tantrum. By Tantrum, I mean full blown tantrum. It started before I could even get out of the shower. He had a clean diaper, he had already ate so I knew it had to be his teeth. Well this tantrum continued until I could get dried off. When I finally could pick him up, he seemed satisfied. As soon as I placed him in his bouncer again, the screaming started again. I continued to try to get ready. I gave him his paci and back to getting ready I went. He seemed content for a few minutes then it started again. Once again, I picked him up, cuddled him and put him back in his bouncy. I started trying to straighten my hair and the tantrum started again. I put my straightener down and I thought I put my mirror down too. I checked on Raylan once again, playing with him for a few minutes. By the time I went to straighten my hair again, I noticed the plastic handle of my mirror was melted to my straightener. Oh boy! I thought I have really lost my mind. I had a mess on my hands and there was no way to fix my half straightened half frizz ball hair. So, I had to throw my hair up in a bun and continue on with our day. Raylan calmed down on the ride to Gatti's and was good all day but he didn't want anyone to hold him except his momma. If I let someone else hold him for a few minutes, he would start crying and reaching for me. Come bath time and bedtime it was like wrestling a grizzly bear. He fought sleep for an hour. Needless to say, I'm exhausted!!! Sometimes I get so stressed out. I get so impatient. I get so irritable. I wish for a few minutes of peace and quite or me time if you will. But then I look into my son's eyes and I know this is exactly where I am meant to be. I wouldn't trade my life for anything. I wouldn't have it any other way. I love this crazy beautiful life that I am living and I thank God for it every single day. Days like today are rough and I have to pray a little bit more for God to get me through the day. But I am still so thankful for his many blessings. especially his wonderful gift of Salvation, my husband, my son, family and friends. It's hard not to get discouraged sometimes especially on rough days like today. If you are a mom then you know what I am talking about. I'm sure you have had days were you felt like pulling your hair out. You just felt frazzled! But that's what being a parent is all about! It isn't always going to be easy but it is so worth it! I wouldn't change a thing! I just count my blessings! What was your day like? Tell me about some of your frazzled parenting days! 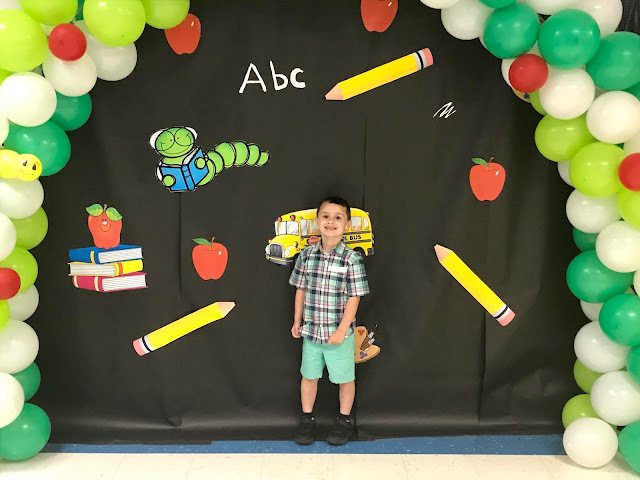 Recently back in the summer I started blogging. My friend Tiffany @Bright on a budget introduced me to it and I fell in love. Blogging is a way for me to be myself. Here I can share my thoughts, my creativity and let others know the real me. I love meeting other bloggers especially other mommies out there. You can really learn a lot from other bloggers. Anyways, I was nominated to do a Tour of Blogland by my friend Tiffany @Bright on a budget. The tour gives you a chance to find out a little more about my blogging process, and to find out more about some other bloggers you may be interested in. I am currently working on several things. I am working on a DIY Coffee Filter Wreath Tutorial, Tips on Frugal Fall Decor and I am also working on another giveaway. Not to mention, a partnership giveaway as well. My blog is different from other genres because its not just based on one thing. It's a mixture of everything from anything God and bible related to DIY crafts, recipes, photography, cake decorating, money saving tips and so much more. I love to be crafty and I love to cook. I also love saving money. I love teaching others new tips. I just find it so much fun. If I can inspire someone then my day has been made. Usually I plan out my blog posts. I try to plan ahead for at least two of my posts per week. I must admit there have been times when I have had to create something spur of the moment to get a post in. A lot of times though, I just get really inspired and start thinking of several posts. I try to write my posts down so I will know what days to post certain blog posts on. Now I'm nominating 2 other fabulous ladies to share their blogging processes. Be sure to surf over to their blogs to say hello and check out what they're into! 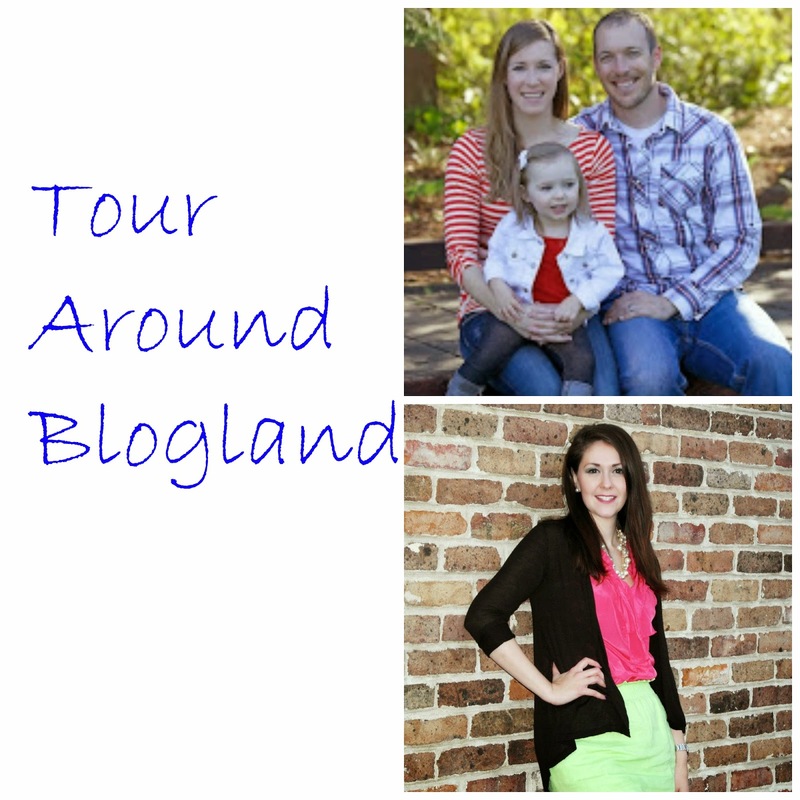 Their Tour Around Blogland posts will be up October 1st, but no need to wait til then to meet these awesome bloggers! 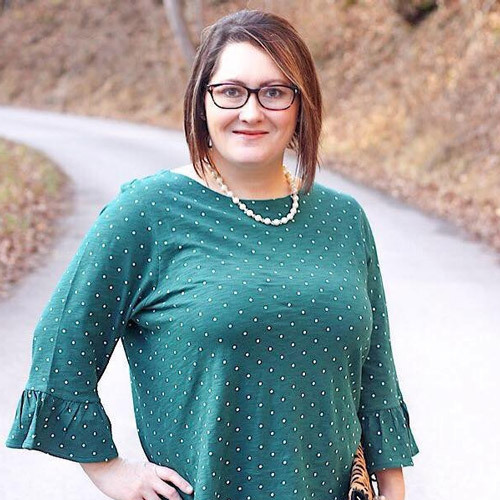 I'm Tiffany and I blog at A Touch of Grace. I started A Touch of Grace in March of 2013 as a way to share my love of baking. Little did I know that a short year and a half later I'd be sharing my love of health and fitness, family and all sorts of things in between with you all! I have the sweetest little girl who amazes me with her smarts every single day. And a handsome hubby who keeps me honest in all things in life (especially diet and exercise). I'm an OCD, coffee drinking, Seattle Seahawks loving country girl at heart. I enjoy spending time with my family being active outdoors as much as the weather in the Seattle area will allow. I'm constantly on the go and barely can take time to stop and smell the roses, but I've learned that once you have kids you lose all control of your life so I just try to go with the flow as much as possible these days. I love to entertain and throw parties, even if it's just having a few friends over for a BBQ. Thanks for stopping by! If you're stopping by from Tiffany's @ Bright On A Budget's neck of the woods, be sure to say hi in the comments below! I had been seeing Citrus Lane advertisements for quite sometime. Seems like it was always popping up on the side bar of my Facebook. I did some researching on the Citrus Lane website and thought I would give it a try. What is Citrus Lane? It is a surprise box that you receive every month for your child. It goes by age, so each child receives a different gift box. You can also gift boxes to others as well or you can simply order just one box. There is even an option to order a baby shower box. * You get a better deal when you sign up for more than one box. The best deal is the 6 month subscription plan. What did I receive for Raylan? My thoughts on Citrus Lane monthly boxes are they are overpriced. You certainly don't get what you pay for. 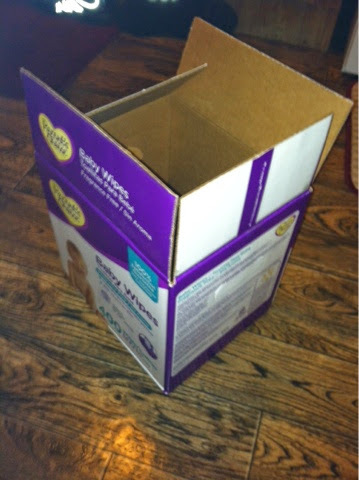 I feel like the boxes could have better gifts in them for babies and small children. To me it was kind of a blah gift to receive if you know what I mean. I don't think I will be ordering anymore boxes and will be canceling my subscription. Have any of you other mommies ordered from Citrus Lane before? If so, have you had better luck? 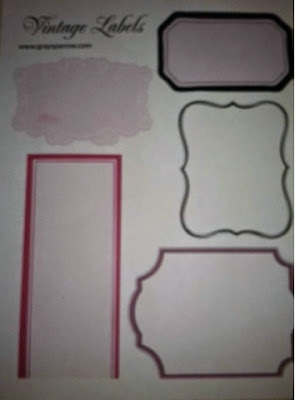 If you visited the blog last week then you saw that I was doing a Fall Door Initial Giveaway. I'm happy to announce that we have a winner! Please note that this was computer generated and I had nothing to do with who the winner was. Congratulations! Nicole Hinkle you are the winner of the Fall Door Initial Giveaway. You should have your initial within the next week. I want to thank everyone who entered. May God bless all of you! Please stay tuned for more giveaways! Yay!!! It's finally Friday! I feel like this has been a really long week. Hopefully the weekend will last as long as what this week seemed like. Let's take a look back at my week. 1) Justin and I finally got to go out and celebrate my birthday. It was a little late due to Raylan being sick but hey better late than never. We ate at Texas Roadhouse which is one of our favorites. I love their rolls!!! Then we made a little trip to the mall. I ended up with a new outfit for fall from American Eagle. Then we made a trip to Starbucks and got my Pumpkin Spice Latte that I have been desperately craving. 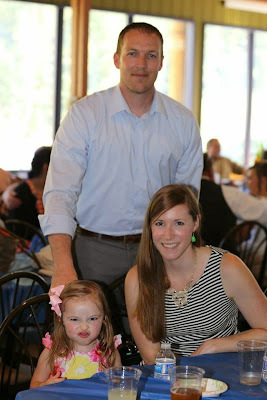 2) We had a couple of friends up during the first part of the week and we all went out to eat (Raylan included) to Los Amigos which is our favorite Mexican Restaurant at the moment. It was nice to have some company and some good food. Walmart now offers a Beauty Box ,which, I signed up for. It's only $5 and you receive a new box each season. I can't wait to see what goodies comes in it. 4) I made a pumpkin wreath made out of coffee filters. I'm pretty happy with how it turned out. 5) I found a recipe for pumpkin butter on pinterest. It was absolutely delicious. It's great to put on toast, biscuits or bagels. You can find the recipe here. You can say I'm a little crazy over everything pumpkin this time of year. How was your week? Have you made any fall treats or crafts? I've been wanting to try Ipsy for quite sometime. I had seen advertisement after advertisement for it but was leery of it. I just didn't want to pay $10 a month for something that probably wasn't worth it. After seeing my friend Tif@Bright on a Budget sign up for Ipsy, I decided to give it a try. I thought the packaging was so cute, not to mention, the glam bag was too. What is Ipsy you might ask? Ipsy is a Glam Bag with deluxe samples and full-sized beauty products all for $10 per month. Upon signing up, you will take a quiz that matches you to the beauty products that you will most likely use. Ipsy then sends you products based on the questions you answered. Overall I am very pleased with my glam bag. I can't wait to get the next one. The only downfall is you have to wait a whole month to get your first bag. Then you get a new bag each month. However, I'm like a kid in a candy store checking the mail frequently to see if it came in. I would highly recommend signing up for Ipsy. It's a great deal. You can't hardly get any beauty products for under $10, and as you can see, I received 5 products for $10. I would love to hear from you. Are you considering Ipsy? For those of you who are already subscribers, what are your thoughts on Ipsy? Please fill out the form below to enter for a chance to win a Fall Door Initial with the initial of your choice. You can enter once per day. A selection will be made Monday September 22, 2014.....Good Luck! This week has definitely been better than last week. Raylan is still sick but he is doing much better. He has had bronchitis for two weeks now and is still on 3 breathing treatments a day. This week has seemed to go by pretty quickly though. So let's take a look back over the last week. 1) Over the weekend, Raylan and I had a visit from one of my best friends Tina. She brought Raylan and me both some goodies. It was so nice to see her. I hardly ever get to see her anymore since leaving work. 2) Monday I turned the big 27...Where has the time gone? I shouldn't be this old. My brother also has a birthday this month so our dad celebrated our birthdays together. Dad got us a cake, Tina got me a cookie and my friend Melissa also got me a cookie. All in all I had a wonderful birthday. I received some great gifts from some pretty awesome friends. Most of all I'm thankful for another year of life and for all the wonderful friends and family that I have. God has truly blessed me to have some amazing people in my life. What's a girl supposed to do with so many delicious treats? I would say I'm dieting but hey it was my birthday. I have an excuse! 3.) Justin and Raylan made me a birthday card. It was my most favorite birthday gift. It was so thoughtful. I will treasure it forever. Having Raylan has made this the best birthday ever! 4) I've been so excited for fall that I have made a few fall crafts this week. I used to never be crafty. I don't know what has gotten into me lately lol. 5) Throughout the week I have had Justin helping me decorate for fall. Overall I'm pretty pleased with how everything looks. Fall is my absolute favorite. I'm so excited for all of Raylan's 1st holidays. Stay tuned for tips on how to have a Frugal Fall. You can have beautiful fall decorations for just a few dollars. Fall is my most favorite time of the year. I love all of the beautiful colors especially all of the orange and red colors. I love the changing of the leaves and the cool crisp air. I love everything pumpkin flavored and all of the fall candy. I seriously could go on and on about fall. I also love to decorate for fall but I don't like the price tag that comes along with it. However with a little bit of help from pinterest and some creativity, I came up with a centerpiece. It's a candy corn centerpiece. Then pour candy corn in all around candle. Be sure to hold candle still with one hand while pouring candy in around the candle with the other hand. This is the final result. I love the bright colors that the candy corn gives off. It really makes the centerpiece pop. This is a super easy fall decoration to make and the best part is the price. It only cost $3.50 to make. You can't even buy a fall decoration for that low of a price. I'd love to hear from you. What fall décor ideas do you have that are budget friendly? I know this isn't your typical High Five For Friday Post but we have been stuck inside this week what time we wasn't at the doctors office. So I haven't gotten to do much other than tend to Raylan. When he is sick he wants his momma, but that is perfectly okay with me. I love my baby boy so much. Hopefully he gets better soon. I will resume my blogging once he gets to feeling some better. Thanks for reading. May God bless you always! With Fall just around the corner, it has me craving all the foods that go with fall. It also has my mouth watering for all the Thanksgiving fixings. I did some searching on Pinterest and found a scrumptious chicken and dressing recipe that everyone is sure to love. 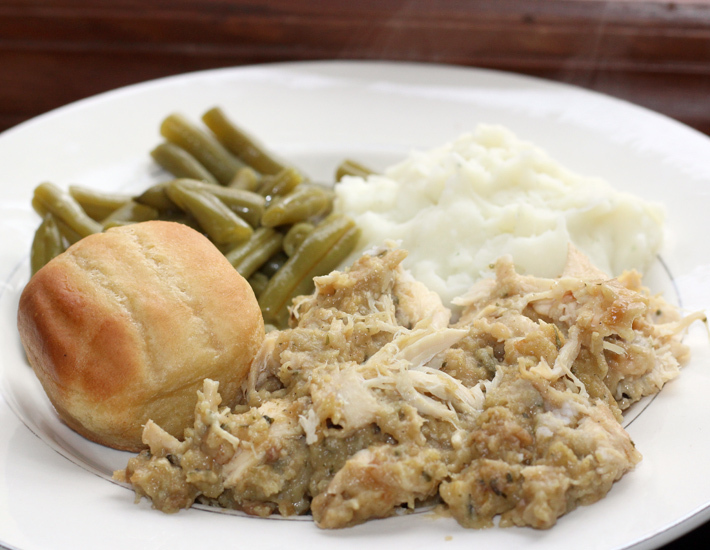 It's so easy to make and the best part is it is Crockpot friendly. cook 6-8 hours on low! It is so amazingly delicious! See how simple this was! I hope you enjoy it. 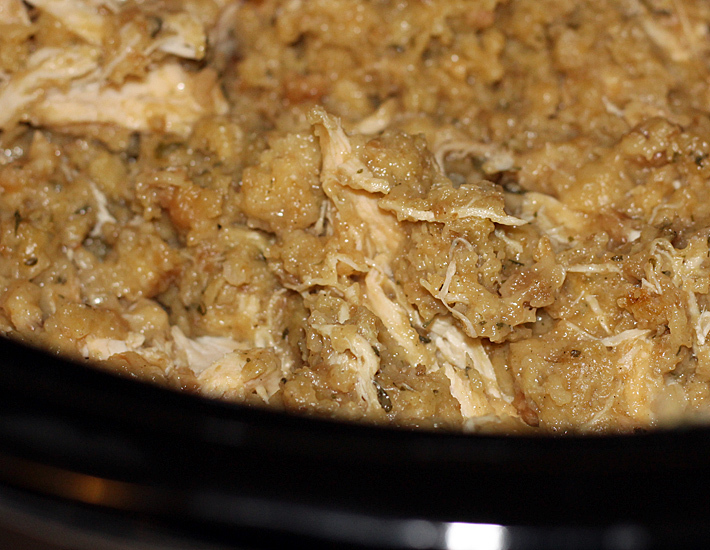 Please share with me some of your favorite crockpot or fall recipes! I love Storage Boxes, especially the ones with pretty designs. What I don't love about storage boxes are the price. For small boxes you will pay at least $4. The bigger the box the bigger the price tag. 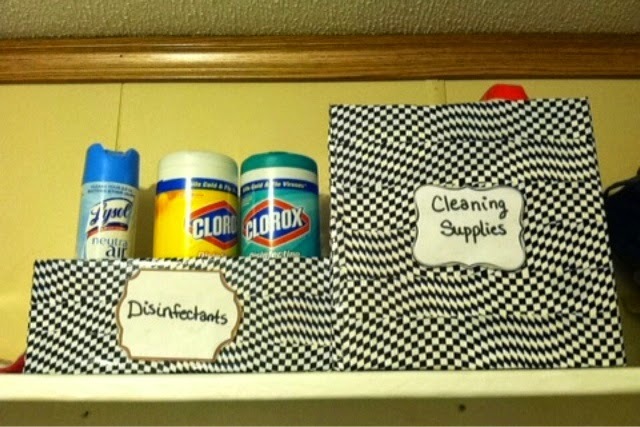 I've been on a organizing kick lately and I was in need of some storage boxes. I didn't want to pay a high price for them so I decided to get creative and make my own. 1) Boxes of any kind. I have a lot of baby wipe boxes so that's mostly what I used. Be sure to cut the flaps off if you want an open box like mine. 2) Designer Tape or Contact Paper. I used Designer Tape because I loved the race flag design since my husband races cars. These are printable labels. I found them here. These were so easy to make and it only cost me $2 and that was for the designer tape. 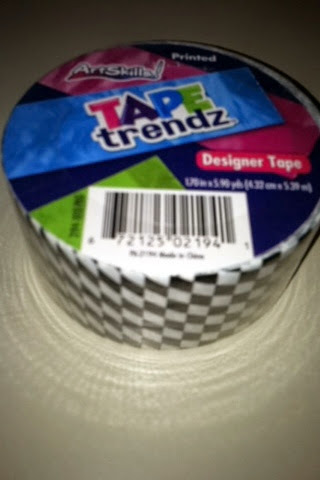 I found the tape at Dollar General. Everything else I already had at home. I'm pretty happy with how they turned out. What do you think?